Our clients, Claire and Rory, wanted a bespoke rustic concrete floor to compliment the style of their Finca (Spanish Farmhouse). A polished concrete floor was the perfect option. 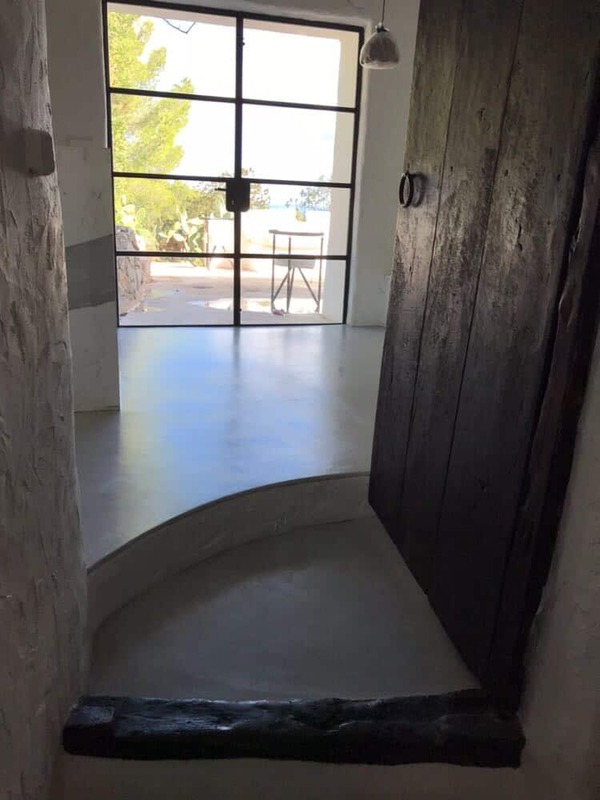 We were delighted to get a request from Claire Dobner, wife of Rory Dobner, to help them to create a polished concrete floor in their fabulous house in Ibiza, The Ink House. Rory is a celebrated artist and illustrator, with homeware ranges stocked in Liberty, London and Fortnum & Mason. 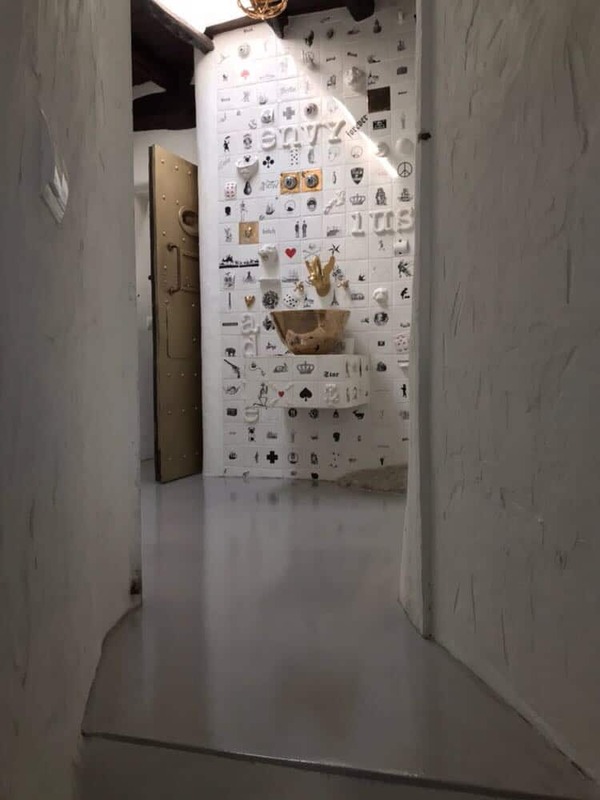 Before Claire made a visit to our polished concrete showroom in Croydon, she had a very clear vision of the look that they wanted: a beautiful, rustic concrete floor. 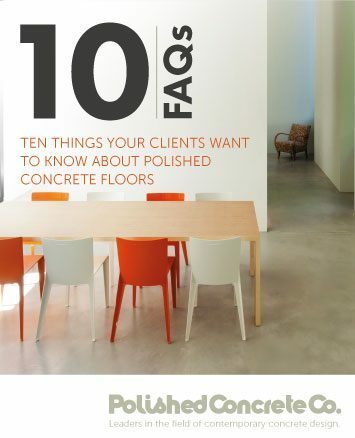 At the polished Concrete Co., we have experimented over the years with different products and have an exceptional range of high quality finishes and colours to choose from, as well as a creative range of styles. We were therefore able to offer the rustic look they were looking for. 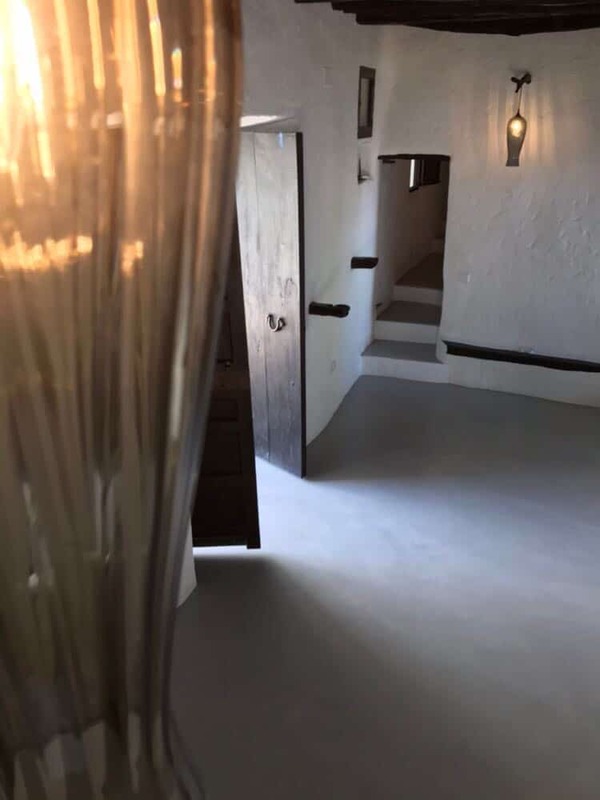 With Rory’s artistic input, we installed a completely bespoke concrete floor that completely fitted their vision of a stylish rustic look to their home. Fincas were traditionally made from stones and mud and quite often the farmer’s animals would take shelter in the house during very hot or very wet weather. This explains the divisions in the house which quite often have long corridors and uneven floors. 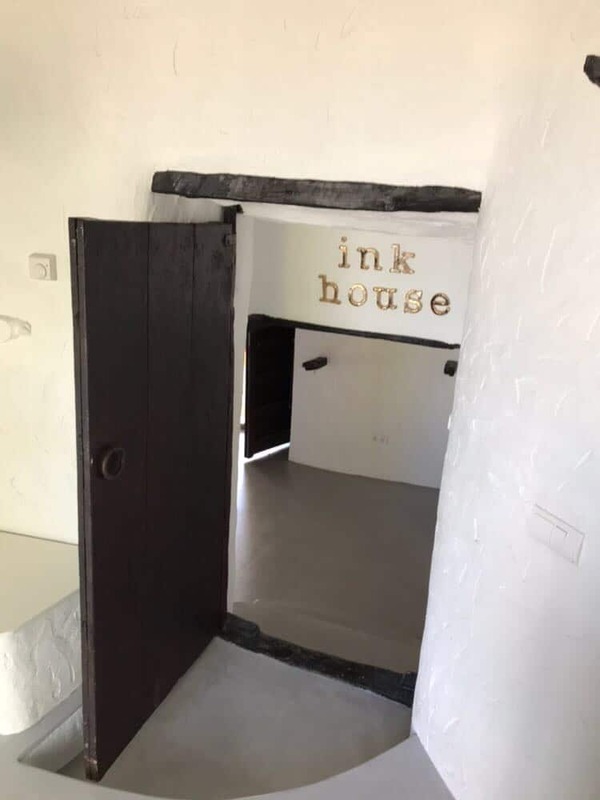 The Ink House, Ibiza was no exception and in the bathrooms the stones actually protrude through the slopping floor. This type of installation requires experienced project management and workmanship to overcome the problems such uneven surfaces throw up. Rory’s art is very intricate with a lot of attention to detail, and he used his eye for detail and colour when designing this floor. Our team created 10 samples for him whilst on site, with varying colours, sometimes within a few grams of colour pigment. The pigment is mixed into the micro cement in order to create the required colour, and it was very important that the slight colour variations were made into samples. When we apply layers of micro cement on a concrete floor, the movement of the trowel creates the finished pattern. Rory wanted a plain floor with a limited amount of movement, so our team created sample boards with various patterns so he could choose how ‘rustic’ the end design looked. 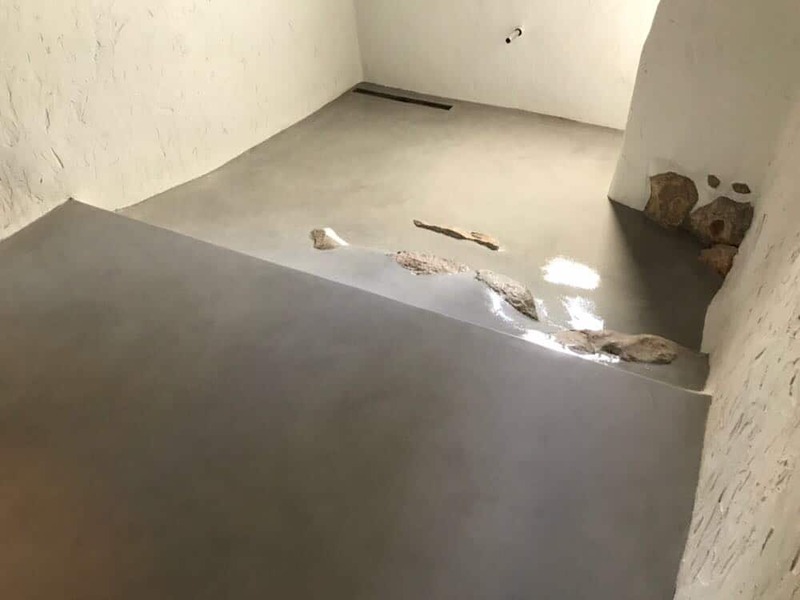 Working with a trowel like this is a very specialist, skilled job and our team are very experienced, enabling them to manipulate polished concrete floor effects into different styles. The idea was to keep the floor looking as natural as possible to fit in with the rustic style villa. It took five days to complete the installation, which needed priming, sanding and several layers of micro topping applied by hand with the trowel. 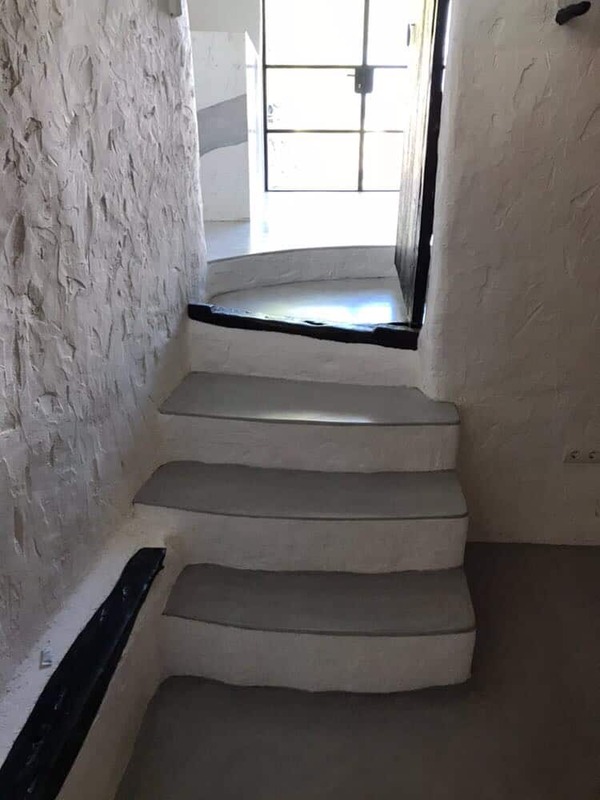 This was quite a difficult test in the heat of the Ibiza location, as the micro cement needs to be laid in one go to prevent “dry lines” which lead to imperfections in the floor. We had to sand the areas around the uneven areas by hand and the only areas which needed a special polyurethane sealer were the bathrooms. 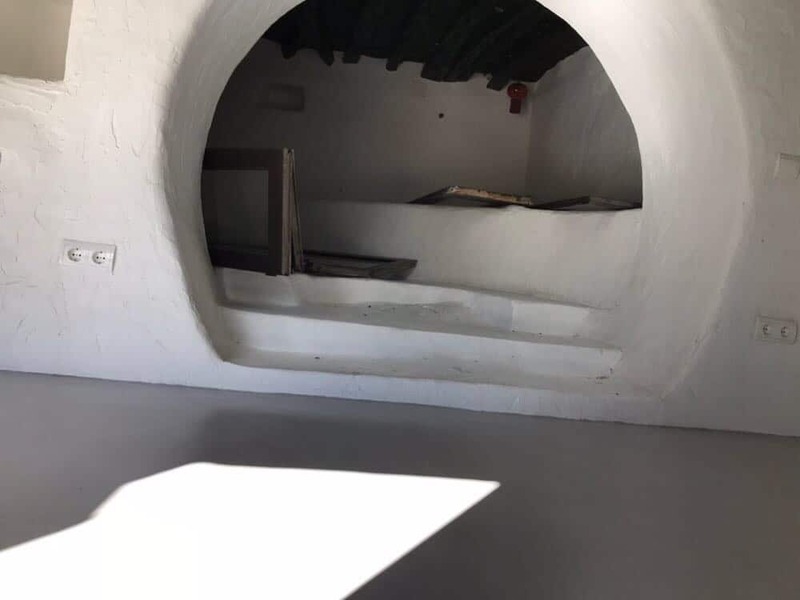 The rest of the flooring areas had a natural looking polished concrete sealant in keeping with the rustic look of the finca. Claire and Rory were delighted with their finished floor and were impressed with the professionalism and attention to detail shown by our team. Our installation team at the Polished Concrete Co. take their jobs very seriously and they are good guys. We call out team the “Kings of Polished Concrete”. After their Spanish adventure, they are the “Gypsy Kings of Polished Concrete” Ole!! If you would like to discuss rustic concrete floor options for your interior, please get in touch. We can talk you through the wide range of options and finishes we have available.